When it comes to buying gold jewelry, Jackson Heights Indian stores offer abundant choice. 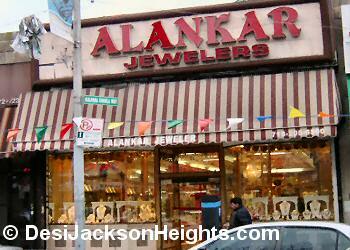 There are over two dozen Indian jewelry stores from 72nd St to 75th St near Roosevelt Ave train station and on 37th Avenue in Jackson Heights. Whether it's designer engagement rings, pendants, anklets, necklaces, bangles, chains or gold biscuits you get them all at Jackson Heights Indian jewelry stores. Besides finished gold and diamond jewelry, Jackson Heights Indian jewelry stores also peddle costume jewelry, fashion accessories and small silver statues of Ganesh, Krishna and other Hindu gods as well. If you are planning on a big purchase for a wedding or festival, I suggest you check around a few stores before splurging.